consolidation of soil under the rail and shape’s enlargement of the tunnel on Lecco – Colico line, section Lierna – Piona, with n.6 consolidated tunnels for a length of 5.506,00 lm; works execution with total breakdown of the line from 05/08/2002 to 02/09/2002 for a total of 29 consecutive days. realization of new central gutter for draining of sewage, consolidation of soil under the rail and crown’s sections for a length of lm 3.000,00 and also the realization of lighting and sound diffusion systems in the Varzo and Trasquera tunnels and fire proof system in the helicoidal tunnel of Varzo, on Domodossola – Iselle line. Works executions with railway operations. safety implementation of Apennine Base Tunnel on Bologna – Prato railway line, with a length of lm. 18.560,00, in which was realized a fire proof system on the whole length, with a reinforced concrete underground passage for fire-proof conduct housing and placing of double cover with REI 120 characteristics, restoring and cleaning of central gutter for water collection. Works execution with railway operations. 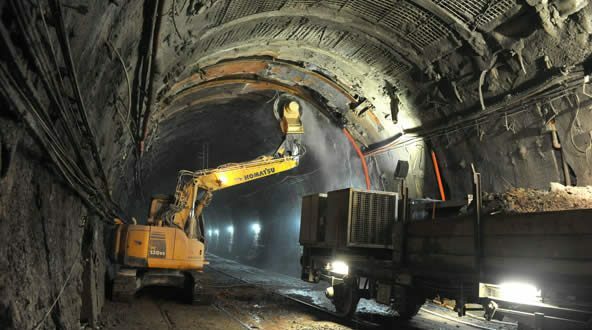 In addition to the works mentioned above Ceprini Costruzioni S.r.l has executed the railway shape’s enlargement of existing tunnels by construction of new tunnels at single track at Amantea, Battipaglia – Reggio Calabria railway line (Coreca tunnel). The new tunnels with a length of about 900.00 ml each, have been realized with a progress method made by a sub – horizontal insertings with metallic packers and injected with pressure cement grout together with metallic temporary centerings system to support excavation area. The new tunnel’s construction was completed realizing the final coating of reinforced concrete consists in prefabricated invert with piers and crown realized with mobile formworks with oleodinamic regulation.